Flik, an individualist and would-be inventor, lives in a colony of ants. The ants are led by Princess Atta and her mother, the Queen, and they live on a small island in the middle of a creek. Flik is different and always unappreciated because of his problematic inventions. The colony is oppressed by a gang of marauding grasshoppers led by Hopper who arrive every season demanding food from the ants. When the annual offering is inadvertently knocked into a stream by Flik's latest invention, a harvester device, the grasshoppers demand twice as much food as compensation. Given a temporary reprieve by the grasshoppers, Flik tricks the ants into accepting his plan to recruit "warrior bugs" to fight off the grasshoppers. 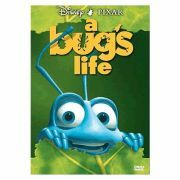 While Flik actually believes in the plan, the other ants see it as a fool's errand to get rid of Flik and save themselves trouble. Making his way to the "big city" (a heap of trash under a trailer), Flik mistakes a group of circus bugs for the warrior bugs he seeks. 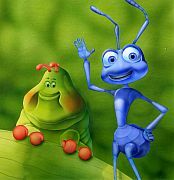 The bugs, in turn, mistake Flik for a talent agent, and agree to travel with him back to Ant Island. Discovering their mutual misunderstanding, the circus bugs attempt to leave, but are forced back by a bird. They save Princess Dot, the Queen's daughter and Atta's sister, from the bird as they flee, gaining the ants' trust in the process. They continue the ruse of being "warriors" so the troupe can continue to enjoy the attention and hospitality of the ants. The bird encounter inspires Flik into creating an artificial bird to scare away Hopper, leader of the grasshoppers, who is deeply afraid of birds. The bird is constructed, but the circus bugs are exposed by their former ringmaster, P.T. Flea, when he arrives searching for them. Angered at Flik's deception, the ants exile him and desperately attempt to pull together enough food for a new offering to the grasshoppers, but fail to do so. When the grasshoppers discover a meager offering upon their arrival, they take control of the entire colony and begin eating the ants' winter store of food. After overhearing Hopper's plan to kill the queen, Dot leaves in search of Flik and convinces him to return and save the colony with his original plan. The plan nearly works, but P.T. Flea lights the bird model on fire, causing it to crash and be exposed as a fake. Hopper has Flik beaten in retaliation, but Flik defies Hopper and inspires the entire colony to stand up to the grasshoppers and drive them out of the colony. Before Hopper can be disposed of, it begins to rain. In the chaos, Hopper viciously pursues Flik, who leads him to an actual bird's nest. Mistaking the real bird for another fake one, Hopper attracts its attention by taunting it. Hopper is eaten by the bird's chicks. Some time later, Flik has been welcomed back to the colony, and he and Atta are now a couple. As the troupe departs with the last grasshopper, Molt, as an employee, Atta is crowned the new Queen, while Dot gets the princess' crown. The circus troupe then departs as Flik, Atta and Dot watch and wave farewell in a tree branch.